Welcome Dreammakers, to the Screenwriter's LOUNGE... where all dreams are possible and where Heroes that were, always will be. Sit back now in a soft lounge chair, with your favorite merlot or cappuccino and a favorite friend, and drift with the fog, filling your imagination with the dreams that are and may be. We Screenwriters are creators of worlds, dreammakers and sculptors of the imaginary, carving characters and worlds out of thought, and bringing forth through the magic of illusion ...that which might be, and for two hours of precious time...is ... if but for a moment. Within our pages you will find the traditional, the tried and true writers' links, as well as a portal into some of the more off-beat and boldly creative sites available on the Internet...devoted exclusively to the screenwriting community. Links, articles and some helpful resources for those of you with an interest in writing for television or the great silver screen. A vocal platform where industry professionals and screenwriters from all walks of life can speak their mind through feature articles and editorials. A great place to turn for the latest news, reviews and interviews or simply learning the craft through the eyes of others. Within these pages you will find up-to-date information on screenwriting and related topics around the Internet. It's all here. The field of video game design has never been more exciting. It's characterized by the possible and the future – from teaching technology to media communications – will be defined by the creative visions of video game designers and developers today. Final Draft is the No. 1 screenwriting program in the world, and has become the standard for writing screenplays, T.V. episodes and stage plays. "The best-selling scriptwriting word processor in Hollywood"
With StoryCraft story-development software, whether you're a published author or have only dreamt of becoming one, you'll create complete, well-developed stories, patterned after actual literary classics and civilization's great myths. Like writing with history's greatest authors, StoryCraft guides you through every step of crafting perfect stories. StoryCraft 4.3 now has full word processors with spell check, thesaurus, and most other things expected of word processors. The mythological method used in StoryCraft has tutor texts separate from the program's-step-by-step method of story construction. We have broken those texts out into a course, which is an excellent introduction to this entirely new method of writing. New Dimensions in Writing is conducted and graded by Patricia Mayo, a leading expert in this brand-new system. It is strongly recommended that you get StoryCraft eventually, so if you only purchase the course first, see the offer immediately below. This thorough, intensive course not only teaches you how to structure your stories using the "Hero's Journey" approach of Joseph Campbell, it also covers developing your characters according to Jung's paradigm. computer technologies with traditional filmmaking techniques. The Art of TV Writing. Screen and Tele Format. Animation. Script tips from a top television writer of "SILVER SURFER" and Executive Creative Consultant on SPIDER-MAN UNLIMITED. 500 hours of written network television, including episodes of STAR TREK: VOYAGER, WALKER TEXAS RANGER, STAR TREK: THE NEXT GENERATION, HAWAII FIVE-0, THE STREETS OF SAN and IRONSIDE. He currently writes for both Scr(i)pt and ScreenTalk magazines. Tips and tools for screenwriters to help them get their scripts and stories read and recommended to the movies. Special features: interviews with film pros, script tutorials, articles, market tips and Hollywood insider information from an experienced LA screenwriter. Some info on some of the great ones. The most comprehensive index of movie and television scripts available on the Internet! The Screenscribe is home to a variety of just-for-fun Hollywood links, including links to movie and television studios, TV Shows and films in current release, and movie directories and archives. 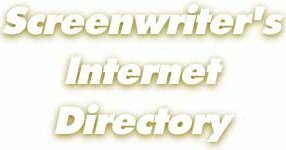 There are also some links to Internet Resources for aspiring screenwriters, both informational and commercial. A place for European screenwriters to post their CVs and outline their work. An extensive database of Film Industry information. This site also provides film investment coordination, business plan marketing and design, a contracts library, web site design, hosting and more. This site will explain and demonstrate the proper script format for some of the shows you probably want to write. ¡The Sitcom Writer's Jump Point! This page is dedicated to all those aspiring sitcom writers like me and even those who have all ready made it. "It's impossible for new writers to appreciate, but the Conference gives them many more times their money's worth in practical advice, inspiration, and contacts. The Conference is one of the best investments writers can make in their careers." Look for the Screenwriting Competition! The mission of the Idaho Writers Connection is to promote the creation and appreciation of writing in Idaho by educating, informing, and connecting readers, writers, and the public. Copyright © 1997-2005 Cinemarquee. All rights reserved.